My confidence in performance and handling of Slinky Malinky, our newly launched Waller 880 bridge deck cat increased every time we went out for a bash around Raymond Island on our home waters of Gippsland Lakes. Twilight racing increased our close quarter skills and we became confident about short tacking in often stiff breezes with little room for error. Our family cruises under spinnaker to the back lake for a barbecue and swim in the ocean whet our appetite for more. While sitting on the beach one summer evening looking out over a benign Bass Strait my wife agreed that we really needed to know how the boat handled at sea. An old chart of the paddock, as Bass Strait is affectionately known, was dug out and a trip was planned. Quite simply we decided to just head south and spend as much or little time at any place as we liked and then to return home when weather permitted and hopefully before the school year commenced. It was the weather patterns that we really studied. We watched and we waited. The boat was loaded up with all the accoutrements of the cruising life with a young teenage family. nlit channel. The racing ebb was determined to send us seaward into Bass Strait but with full power from our 9.9hp four stroke outboard we clawed out of the torrent into the quiet' waters of Cunningham Arm for a night's sleep before heading to sea. f hours. Old habits are hard to break. When Carol and I crossed oceans nearly 20 years ago we had only compass, sextant and a clock. For depth there was a lump of lead on a string and for speed through the water we would just know. I am just not happy if there is not a mark on a paper chart, however old it is! We were headed for the Kent Croup Islands of Deal, Dover and Erith some 100 miles from Lakes and this amazing little beeping box told us where we were, how fast and how far to go, and also how far off course we were. It was all too easy transferring this information to the chart. To get back on course we would have to drop the kite and that just wasn't an option. The sailing was just too good. With increasing winds Carol suggested we drop the kite. So we did, as you do. She later suggested we put a tuck in the main. This too we did. Now we were down to nine knots but were back on course. The GPS advised that at current speed and heading we would be anchored in East Cove, Deal Island before dark. 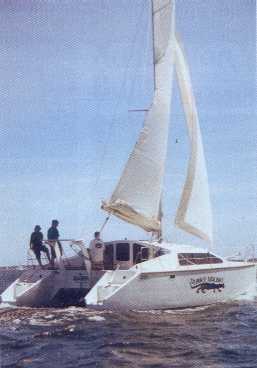 One hundred miles in daylight hours is good sailing in a 28' cruising cat and as the high rocky island group climbed over the horizon even the recovering seasick crew reveled in our fast and safe passage. Just as predicted we had the hook set in the quiet crystal clear waters of East Cove before dark. 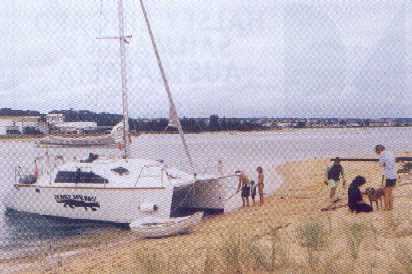 Anchored in the cove was a lone Tasmanian trading ketch, complete with topmasts and bowsprit. It was a turn of the century vista with the whitewashed cottages on the hilltop above. t morning with limpets from the rocks for bait, Ben and Rosie caught breakfast in about five minutes flat. Before I could remove a fish and bait up (Dad's job) another fish would be flung my way. This was fishing and without refrigeration we had to stop. Fish keep a lot better live and we could come back for more later. We did. The lighthouse at Deal Island is one of the highest in the world at 1000' elevation. It was built by convict labour and commissioned in 1848 and every stone and piece of machinery for construction was carried or dragged from the bay we were anchored in. The light was decommissioned in the 1980's as the light was mostly in cloud and of little use to mariners. It was replaced with two lights set on nearby islands marking safe passage to the north and south of the group. Deal is now a National Park and has resident volunteer caretakers whom are invariably knowledgeable and social characters. There is a museum in the old light keeper's cottage, a major exhibit being the world's papered with newspapers of the time. The Kent Croup certainly has a colourful history of wrecks, sealers, fishermen, pirates and poachers. Some of it modern day brigandry. d on the lighthouse tower balustrade was a blast, quite literally. 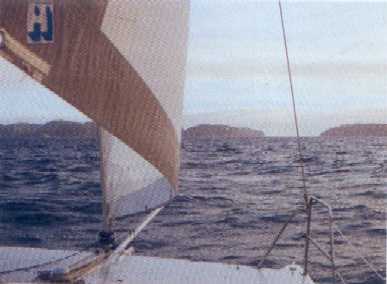 The view across Murray Pass to Erith Island revealed the fine westerly anchorage. 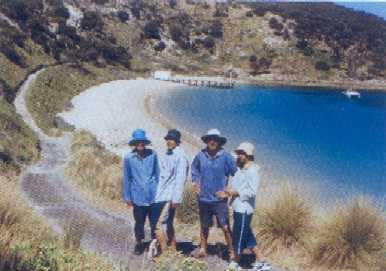 Murray Pass can be a millpond or a seething cauldron depending on wind and tide configuration. A five knot current can run making it interesting crossing over to Erith, if a westerly change is imminent. The remains of a wreck are visible on the Erith beach and best holding is to the south of the beach in a rocky bay. The fishing is good everywhere. Next day with the north-easterly howling above and the boat bobbing gently on the pick Ben and I snorkeled around the cove spooking a lot of fish with a spear gun. I managed to spear a few and found abalone. Anchored to a rock in the dinghy Rosie caught more so we invited the caretakers and the crew of a returning Hobart race boat for a barbecue on the beach. We had the fish, they had the cold beer and hot bread rolls came down with the caretakers. We shared food and tales and a couple of cheeky and fearless wallabies and a possum helped to clear the table. This was good cruising and something Carol and I remembered from years gone by. Ben and Rosie were enjoying themselves but weren't too keen about the prospects of the return passage. ast south-westerly winds. It might be a little rough for a while as the north-easterly seas were countered by the 20 knot westerly but it would be fast and safe so we went. With a triple reefed main and occasional breaking seas we charged north and once clear of the slop around the islands settled into some fast sailing. Neither Carol, Ben nor Rosie were seasick but skies were grey and the odd wave caught us off guard. 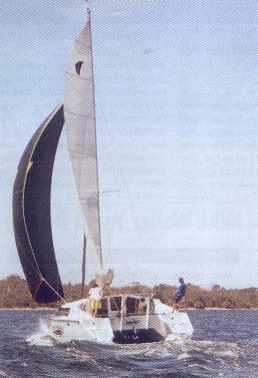 Slinky Malinky surged along, the dolphins returned and the miles passed quickly under the mini keels. 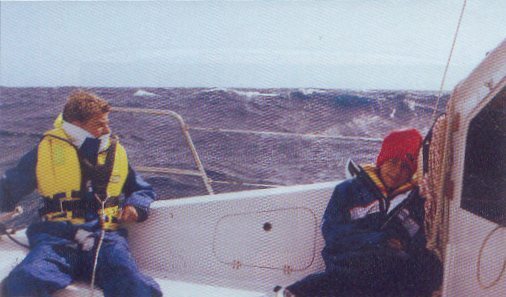 With an increasing wind we dropped the main and reached under head sail alone surfing at times into the low teens. The only downside was that the tiller pilot had no chance of handling the conditions so we had to steer. This was easier on the boat and much faster as we could anticipate and correct the helm before required. Our plan was to arrive off Lakes in the early hours and heave too before assessing the bar. Hopefully the winds would ease before dawn as often happens in northern Bass Strait and we could cross the bar without too much drama. Once again oil rigs appeared, this time lit up like a city, and disappeared behind. The wind died and we were too lazy to hoist the main so ran on slowly into the approaching dawn. The seas too were abating. This was a good thing. After a couple of hours hove-to well clear of the entrance we approached the leads. A small sea was running but the bar didn't look bad so we decided there wasn't an ebb tide or much of one anyway and went for it. A long slow swell picked us up and committed us to the entrance. Here we were surfing and totally under control. The wave passed and we throttled up to cross before the next wave approached. It was small but gave us a lift to 13 knots as we entered between the two groynes at the entrance. Silting had occurred in the five days since our departure but with an obvious flood tide we crossed over into the fast running but calm water of the Gippsland Lakes. Slinky Malinky had surpassed our expectations and was continuing to prove itself as a simple and able small cruiser. Designer Mike Waller should be pleased with his efforts to create a small, solid and seaworthy boat for those of modest means and aspiring dreams.